The Met Office has issued severe flood alerts for over a dozen areas along the Thames as the bad weather continues to batter the UK this week. The Environment Agency has also warned homeowners to be on their guard as water levels will rise and threaten to flood thousands of homes. The South of England will be hardest hit this week as the forecast for the next 5 days with large downfalls of rain while the rest of the UK can also expect plenty of rain and snow. 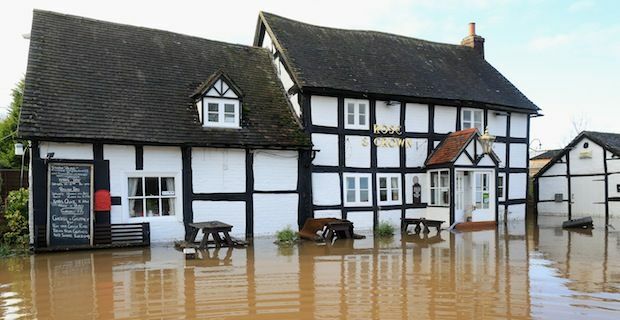 16 communities along the Thames are most at risk with the Environment Agency stating that the rising water levels could pose a risk to peoples lives. Properties along the Thames at Datchet, between Black Potts Bridge and Albert Bridge, at Old Windsor, from Friday Island to Magna Carta Island, at Wraysbury between Old Windsor Weir and Magna Carta Island as well as areas between Runnymede Pleasure Grounds, Staines and Penton Hook and homes by the river between Littleton Lane and Shepperton Lock are all at high risk. Paul Leinster of the Environment Agency has appealed to the general public to be vigilant saying “I urge the public to sign up to our receive free flood warnings, check their flood risk, and keep up to date with the latest situation on the Environment Agency website and on social media using #floodaware”. Widespread flooding has devastated hundreds of homes already this winter and the Environment Agency has a big job on its hands to bring some relief to the hardest hit areas. The latest batch of heavy rain adds to the record breaking levels experienced in January and the UK is on track for one of the wettest winters on record with the rain forecast for the coming week.